The Training Centre offers three (3) types of Crisis Prevention Trainings. Defusing Hostility Two-Day Training (Training provider Canadian Training Institute – CTI). Staff and supervisors are increasingly intervening with people who are angry, hostile, aggressive and violent. This intensive two-day training program will provide you with the knowledge, self-awareness, and skills to verbally defuse hostility and aggression, work more effectively as a team, and manage the stress often experienced through such encounters. This workshop will help you to: understand the dynamics of anger and hostility; manage and defuse yourself through a journey of self-exploration of early learning about anger and hostility and personal value conflicts; effective verbal/non-verbal skills for de-escalating anger, hostility and resistance; a holistic approach to utilizing the “individual in crisis” to guide the intervention and de-escalation process; and understand the impact, causes and symptoms of compassion fatigue and traumatic stress. This certificate is valid of 1½ years. * Toronto Hostels Training Centre does not offer a ‘refresher’ training in Defusing Hostility. 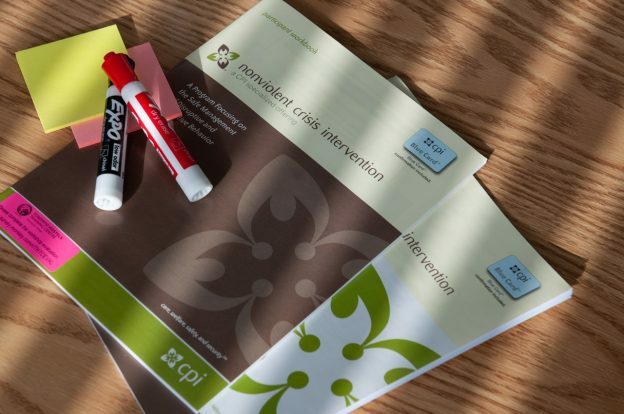 Due to the Crisis Prevention Institute’s delivery restrictions regarding their Non-Violent Crisis Intervention Program, THTC is only able to provide this training to the Centre’s members. Should you wish to become a member of THTC, please refer to the Become a Member page. This interactive workshop will focus on prevention techniques on how to intervene with an escalated individual. *Non-Violent Crisis Intervention – CPI Two-Day Training (Training provider Crisis Prevention Institute). The first day will introduce you to basic crisis intervention techniques. Learn to recognize warning signs that allow for early intervention, plus how to use verbal and nonverbal techniques to avoid a violent confrontation. The second day of the workshop trains participants in safe physical intervention procedures, including personal safety — when and how to intervene safely. An effective team approach to intervention will also be included. A certificate (blue card) will be issued upon successful completion of the two-day course. This certificate is valid of 1 year. * Toronto Hostels Training Centre does not offer a ‘refresher’ training in CPI. Understanding and Managing Aggressive Behaviour (UMAB) Two-Day Training (Training provider Hy’N’Hancement Consulting Inc.) In this Understanding and Managing Aggressive Behaviour Orientation Program, participants will examine the parameters and theories of contributing factors, verbal/physical presentation to de-escalation, self-awareness, and disengaging and self-protection skills. To effectively assess the situation and apply the appropriate strategies (least intrusive and least restrictive) with individuals who experience difficulties and at times express it in an unsafe manner. Successful participants will receive a card of recognition from Understanding and Managing Aggressive Behaviour (UMAB) Canada. * Toronto Hostels Training Centre offers the two-day training only. * Toronto Hostels Training Centre does not offer a ‘refresher’ training in UMAB.